The Klamath River is closed to salmon fishing again this fall after the number of fish caught reached the small allotted quotas1. Poor run size (escapement) continues to be a problem, especially for the Scott River, a major spawning tributary of the Klamath. The 2015-2017 Scott run was approximately 2000 spawners, as compared to over 12,000 in 2014. Few fall-run salmon have been counted in the Scott this fall, compared to 4500 on the Shasta River. A past post describes the problem in detail. The key factor in the decline of Scott fall Chinook has been poor late summer and early fall flows. Low flows do not allow adult salmon to ascend the Scott from the Klamath. This not only hurts that year’s Scott run, but out-year Scott (and Klamath) returns two to five years later. The problem is especially acute this fall, with flows less than 10 cfs, less than 20% of the historical average (Figure 1). In fall 2017, flows were near or above average (Figure 2), leading to a small increase in the run to 2500, despite poor flows during the 2013-2015 drought. The strong 2014 run also helped. The solution is simple: stop irrigating pastures and hayfields in Scott Valley after September 1. Many ranchers do, especially for hayfields, but not all. If that is not possible, there are many idle wells of 5-10 cfs capacity each that could pump water into the river to keep the river adequately watered, with little threat to subsequent winter groundwater recharge. A battle is brewing over Scott River water use and the public trust salmon resources. Figure 1. 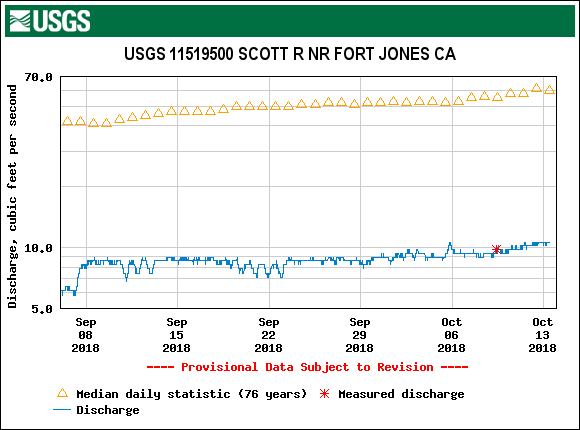 Scott River flows fall 2018. Figure 2. Scott River flow in fall 2017. 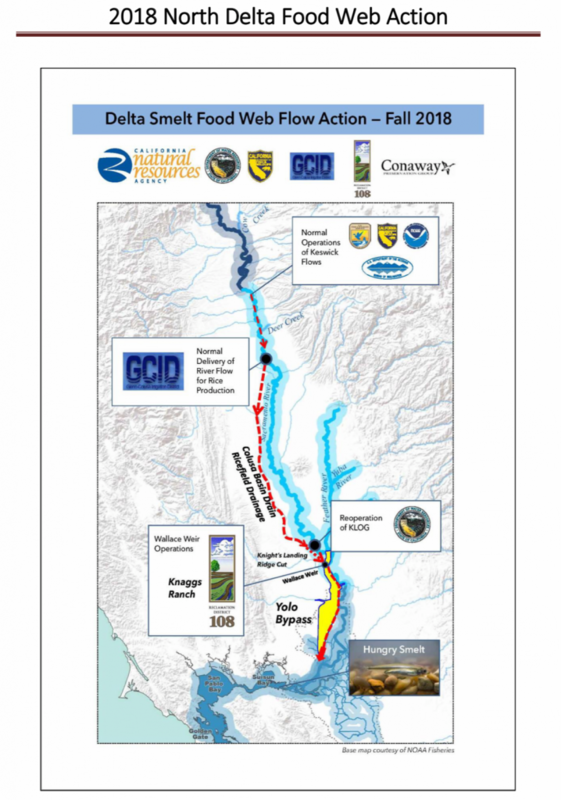 A summer pulse flow through the Yolo Bypass via the Colusa Basin Drain (Figure 1) was implemented in September per the Delta Smelt Resilience Strategy’s North Delta Food Web Action (Figure 2). I reviewed the initial application of the action in July 2016, concluding then there was no evidence that the action would meet its overall goals, but that the approach had potential. – The action is designed to maximize the environmental benefits of water. Water isn’t “consumed” by the action–it is directed down a different and more productive path to the Delta. (Note: The basic concept is simple. The nutrient-laden drain water stimulates Yolo Bypass productivity, and the added river water flushes it through to the north Delta. Taking some of the Sacramento River at Red Bluff and routing it through the Colusa Basin irrigation and drainage system, then on to the Yolo Bypass tidal channels, should stimulate biological productivity and flush it, along with excess nutrients and organic debris from rice fields into the Delta at the end of the Bypass (Cache Slough – Rio Vista area). The Delta (and smelt) would benefit from the added biological productivity (phyto-zoo plankton) and nutrients (nitrogen, phosphorous, and organic carbon). Does the concept work, and does it come without complications? During implementation in 2018, there was an 60% uptick in aquatic plant productivity in the lower Yolo Bypass (Figure 3). There was no increase in productivity as of early October in the north Delta at Rio Vista (Figure 4). The water routed through the Bypass was initially warm (>70oF, Figure 5), high in salts (Figure 6), lower in turbidity (Figure 7), and low in dissolved oxygen (Figure 8). 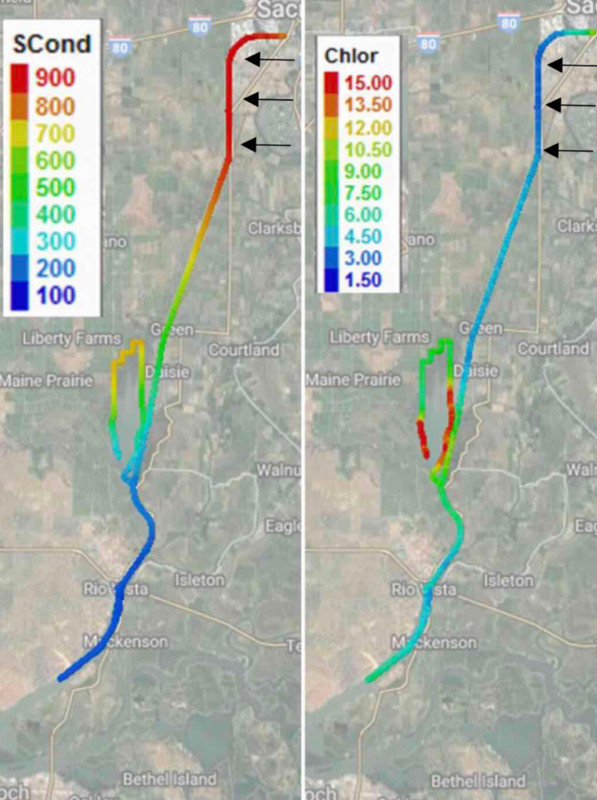 Warm water and the high organic load resulted in poor dissolved oxygen levels (3-5 milligrams-per-liter) that violate state standards and are potentially lethal to salmon migrating through the Bypass1. On a positive note, routing drain water to the Bypass does keep the poor quality drain water out of the Sacramento River below Knights Landing. In sum, the benefits of the action remain questionable. Waiting to conduct the action until fall when waters are cooler could alleviate high water temperatures and low dissolved oxygen in the water. It might also create more Delta benefits by delaying nutrient use until nutrients reach the Delta. Further research is warranted into the water quality of the drain water, especially its oxygen-depriving, high-organic load and its chemical constituents (salts, herbicides, and pesticides). Otherwise, it may be that the action is little more than an augmentation of the current practice of dumping what might be described as polluted agricultural drain water into Central Valley rivers and the Delta. Figure 1. Stream flow (cfs) in Yolo Bypass below Colusa Basin Drain outlet. 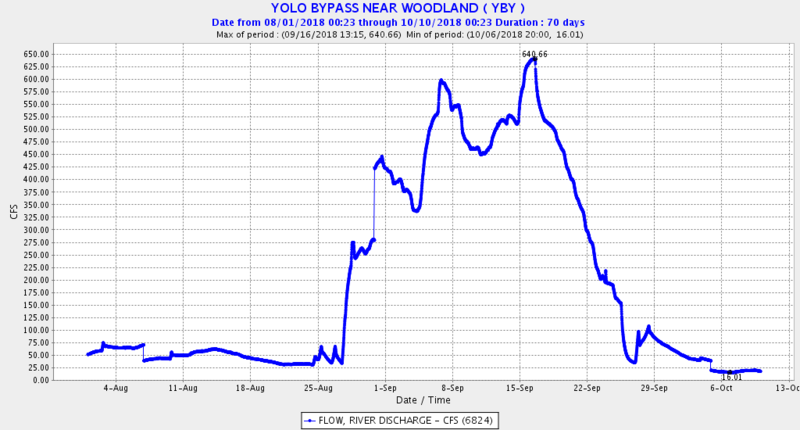 The pulse flow reached the Yolo Bypass on or about August 28 and ended on September 25. Figure 2. Project scheme and map of key features. Figure 3. 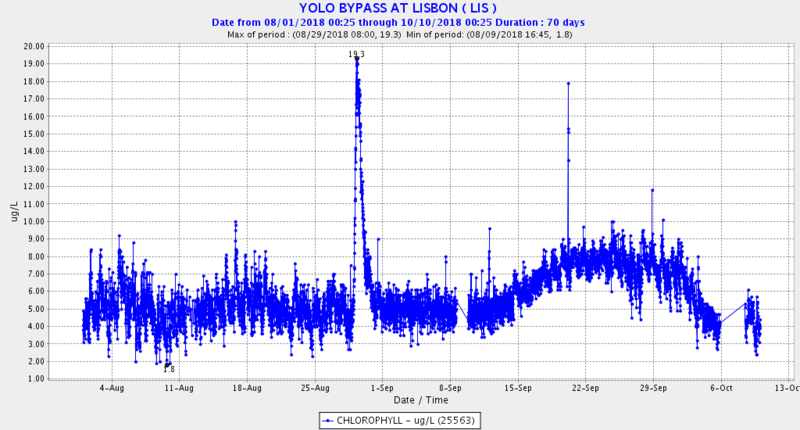 Chlorophyll concentration in lower Yolo Bypass at Lisbon in late summer 2018. There was a 50% increase in late September to about 8 micrograms per liter, although below the target of 10 or higher. Figure 4. 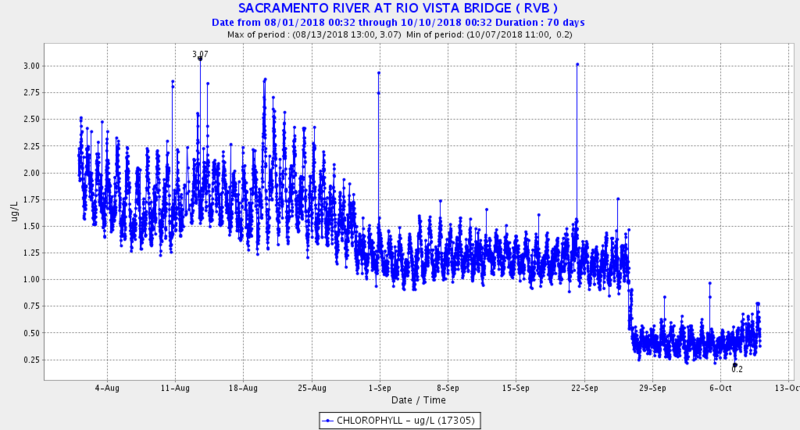 Chlorophyll concentration in north Delta at Rio Vista in late summer 2018. There was a slight decline after September 1 to about 1.25 micrograms per liter, well below the target of 10 or higher. Figure 5. 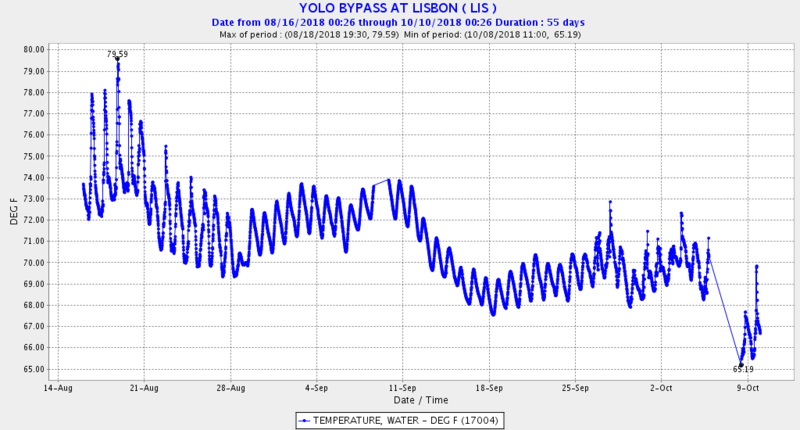 Water temperature in lower Yolo Bypass at Lisbon in late summer 2018. Figure 6. 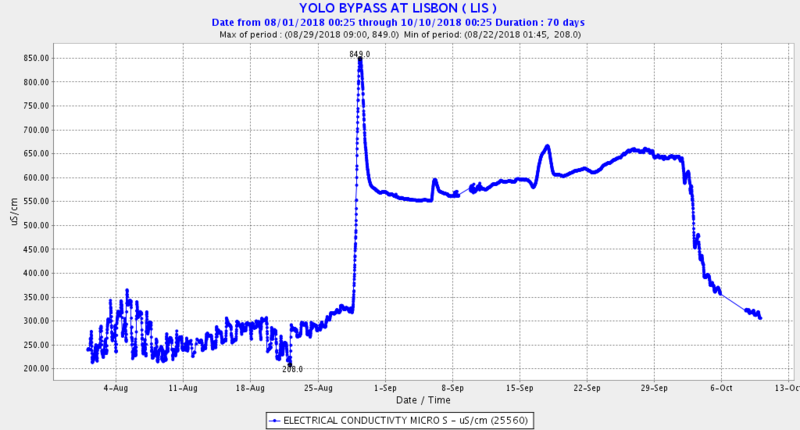 Salt concentration (EC) in lower Yolo Bypass at Lisbon in late summer 2018. The drain water entering at the end of August had a high salt concentration. Figure 7. 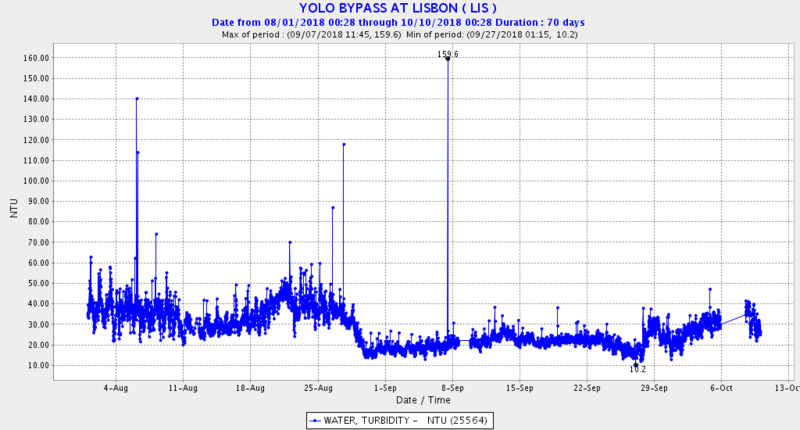 Turbidity (NTUs) in lower Yolo Bypass at Lisbon in late summer 2018. Figure 8. 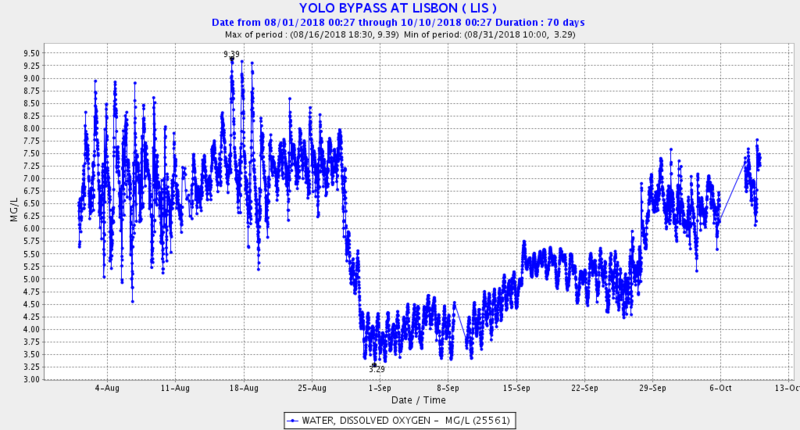 Dissolved oxygen (mg/l) in lower Yolo Bypass at Lisbon in late summer 2018. The drop in DO at the end of August reflects the high organic load of the drain water. The Bureau of Reclamation has issued final environmental documents for the Sacramento Deep Water Ship Channel Nutrient Enrichment Project. The project’s purpose is to determine if the addition of nitrogen can stimulate (fish food organisms) production in a section of the ship channel, which is isolated from the Delta in terms of water flow. The project is an initial step in a broader effort to determine if, through the repair of the West Sacramento lock system, Sacramento River flows could be used to move fish food organisms through the Sacramento Deep Water Ship Channel to the Delta. This step seeks to benefit delta smelt and the Bay-Delta System. The press release and project Final Environmental Assessment (EA) are misleading in representing existing conditions and future project benefits. Reclamation fails to explain the high EC (salt levels) in the project reach of the upper ship channel (Figures 1 and 2). Figure 1 includes three black arrows added to the project figure. These arrows represent large municipal/agricultural drains from the adjacent West Sacramento “island basin” that add salts, nutrients, and other wastes to the ship channel on a seasonal basis (generally early spring). The poor productivity in late summer may be at least partially due to these “waste” discharges. The EA says: “This will restore nitrogen levels that occur naturally earlier in the season before drawdown by phytoplankton growth.” However, high nitrogen levels are not “natural.” They are man-made. The EA says: “The fertilizer to be used for this experiment contains 1% ammonium nitrogen (NH4-N).” The press release and EA fail to mention billion dollar efforts to remove ammonium nitrate inputs to the north Delta from the Sacramento Regional Wastewater Treatment facility. The press release acknowledges that repair of the ship channel gates would allow seasonal pulses of high plankton productivity to be flushed into the north Delta. Effective operation of these gates (selective opening and closing) would move existing blooms in the upper Ship Channel down into the Delta, likely eliminating the need for the addition of nitrogen. It would also reduce the temperature of the water in the Ship Channel. For more on these issues, see a previous post. Figure 1. EA figure of EC (salt) and Chlorophyll levels in ship channel. Added black arrows show West Sacramento drains into ship channel. Figure 2. EA figure showing consistent high EC levels in upper ship channel. 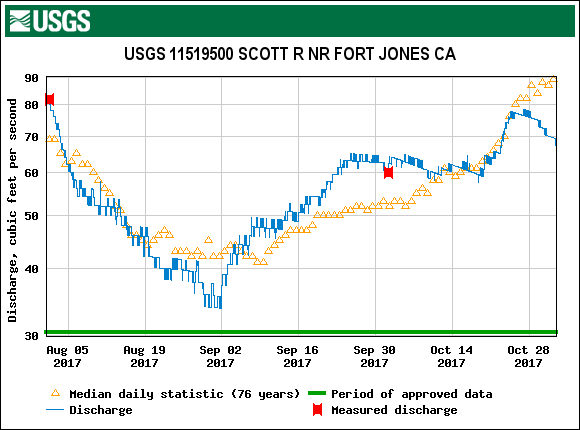 The Yuba River had a record low fall Chinook salmon run in 2017 (Figure 1). Why are our salmon populations plummeting in the Yuba River and many other rivers in the Central Valley watershed? It is because hatchery and wild salmon survival was poor in rivers, the Bay-Delta, and ocean during the historic 2013-2015 drought. 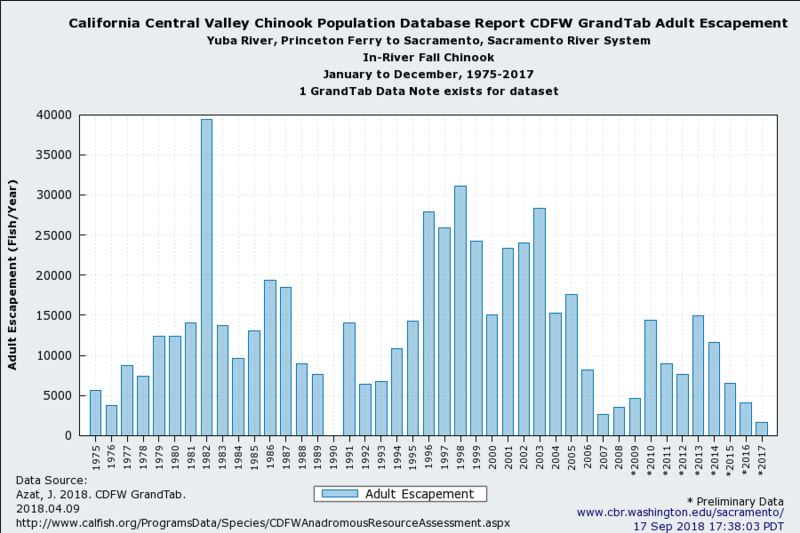 What is it about the Yuba salmon run that can tell us something about the overall salmon decline in the Central Valley? First and foremost, the Yuba run consists predominantly of strays from many of the Central Valley salmon hatcheries. The Yuba has no hatchery. Many of the adult salmon in the Yuba have their origin from smolts produced at Battle Creek, Feather River, American River, Mokelumne River, and Merced River hatcheries. Hatchery salmon survival and production was generally lower in the drought, thus contributing fewer strays to the Yuba. Feather River Hatchery production was an exception (Figure 2) because its managers trucked and barged many of its smolts to the Bay. Second, production of wild salmon was lower during the drought on the Yuba and other Valley rivers. 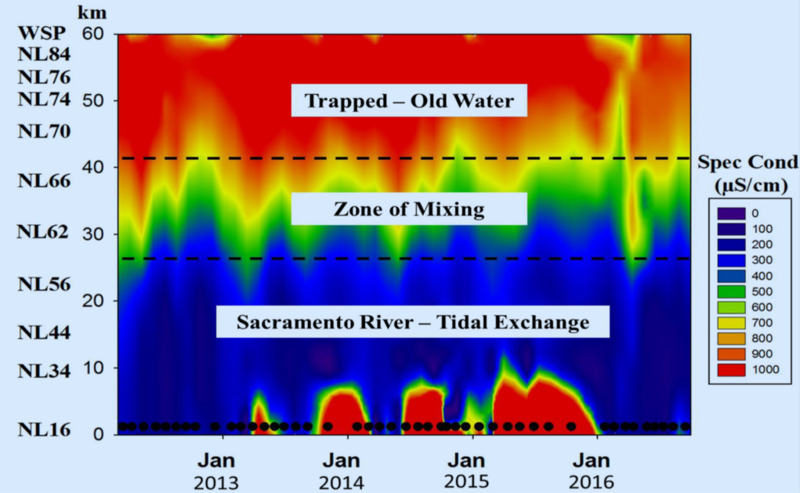 During the spawning runs in late summer and fall 2014, flows were low (Figure 3) and water temperatures were high, leading to high pre-spawn mortality and poor egg viability. Low flows led to less available and lower quality spawning habitat. Spawning in low-flow gravel beds led to redd scouring in late fall and early winter storm flow events. Low winter and early spring flows led to poor rearing and emigration survival. Third, salmon spawning and rearing habitats (gravel beds, riparian vegetation, channel morphology, large woody materials, etc) are lacking or declining in quantity, quality, and availability. The Yuba’s prime spawning and rearing habitats above Daguerre Point Dam suffer from lack of gravel replacement supply below Englebright Dam in the upper reach and confinement of the river channel and floodplain in the lower reach within the historic dredge-pile levees of the Goldfields. Likewise, habitats in the lower river below Daguerre also suffer, while favoring native and non-native predatory fishes that further limit survival of young salmon. Fourth, low fall flows in 2017 (Figure 4) also likely reduced attraction of adult spawners, and possibly caused redd dewatering and subsequent redd scouring. So what needs to be done to increase the Yuba (and other Valley rivers) salmon runs? Increase survival of all Valley hatchery smolts by trucking and barging. Battle Creek Hatchery strays are regularly the greatest component of the Yuba run. Increase fall base flows into the upper portion of their optimal spawning flow range (from 500 cfs to 700 cfs) to attract spawners, lower water temperatures, maximize spawning habitat, and reduce potential redd dewatering and scour after spawning. Lower summer-fall base flows also contribute to exaggerated thalweg channel scour and downcutting, and loss of side channels because of the confined channel. Increase winter-spring flows to improve fry/fingerling/smolt survival during rearing and transport to Bay-Delta and to reduce predation by pikeminnow, striped bass, trout, and shad in the lower Yuba River below Daguerre Point Dam. Improve winter fry rearing habitat available at low winter flows by improving riparian vegetation, adding large woody materials to the low flow channel, and opening the channel and floodplain to increase surface area, increasing distributary channel networks, and lowering channel velocities. Add gravel to the upper spawning reach downstream of Englebright Dam. Capture some of the natural juvenile salmon production at Daguerre Point Dam and transport to Verona for barge or truck transport to the Bay. Stock Feather River Hatchery smolts into the lower Yuba River. Rear Feather River Hatchery fry in lower Yuba River floodplain habitats including managed rice fields. Recover naturally produced juvenile salmon trapped in floodplain habitats after high flow events. Figure 1. 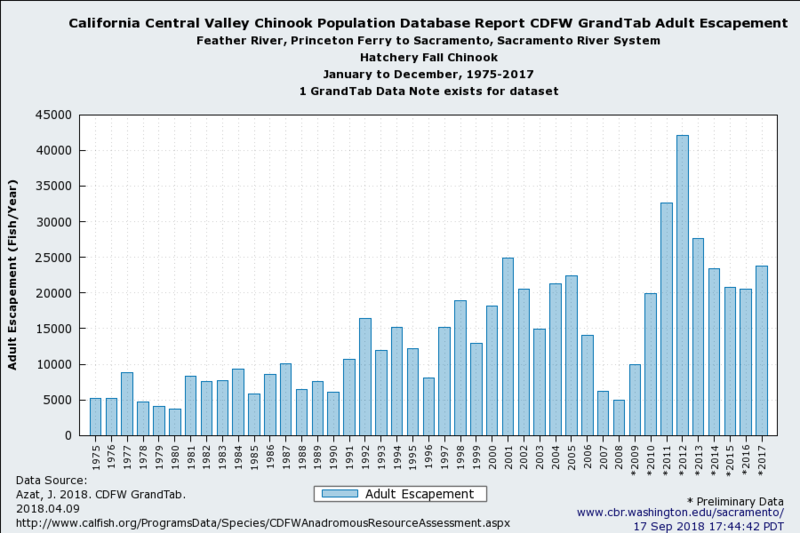 Chinook salmon fall run Chinook salmon population estimates from 1975 to 2017 for the Yuba River. Figure 2. Hatchery returns to Feather River 1975 to 2017. Figure 3. 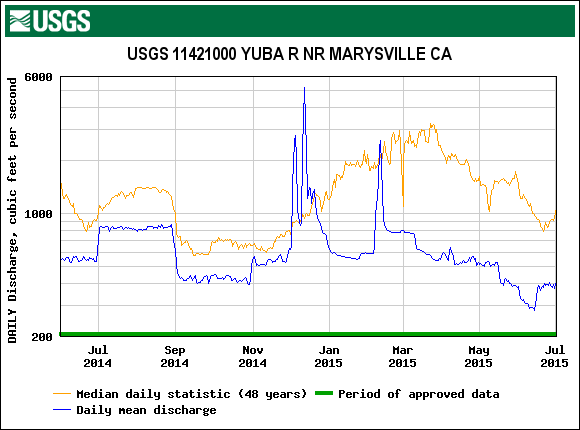 Yuba River flow at Marysville June 2014 through June 2015 with 48-year average flow. Note low summer-fall flows and high December flows in 2014, and low spring flows in 2015; these stresses likely contributed to record low 2017 salmon run. Figure 4. 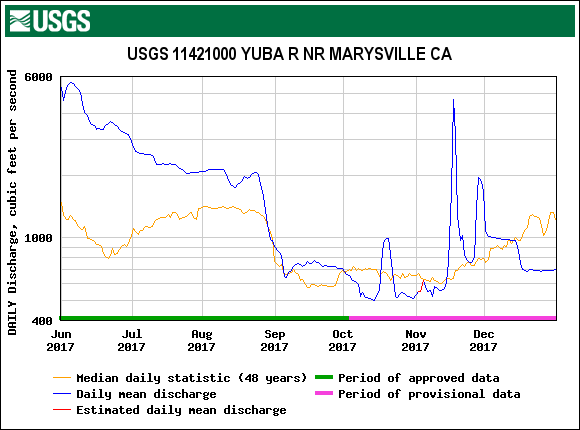 Yuba River flow at Marysville June 2017 through December 2017 with 48-year average flow. Note low October to mid-November flows followed by high flows in late November.